Tag Archives for " world clock "
10	Are You Time Zone Challenged? With the move to Internet technology, marketers are easily reaching prospects around the country and around the world through teleseminars, online meetings and webinars. Serving this world community or being served as a member of the world community presents some folks with time zone issues. This seems like such a silly thing to devote a post to, but I get lots of questions every time I host an event. Okay, none of that really matters though if you just use this online World Clock. You don’t need to know much about time accept that if you are attending a webinar that is listed as Noon CST, just plug that into the world clock and it will determine the current offset of time. You can even set-up meeting planners that allow you to input the four different cities of the attendees and produce a table of times for all concerned. 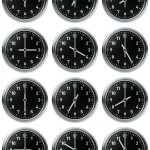 You can create a personal world clock and always know what time it is in your most frequented time zones and cities. If you market online with events it’s a good idea to publish a link to this kind of tool on your registration and event pages so that people can access the correct time of the event. I have noticed that this issue seems to challenge men and women in different ways, but that’s all I’m on that.